Our Brignole Vineyard was originally planted in 1908 by their family, who were members of the Asti Italian-Swiss Colony cooperative. The grapes are an old style field-blend of 80% Zinfandel, 10% Petite Sirah, 5% Carignane, 4% Mataro and a 1% smattering of Alicante Boushet, Muscat Canelli and Golden Chasselas. In those days, growers didn't sell perishable uncrushed; instead, they sold wine in barrels, blended for the specific tastes of their customers. All old-vine vineyards are field-blends, because winegrowers planted their own distinct blends of grape varieties to be harvested and fermented together. Every grape grower was a winemaker, too, and thereby known for their signature wine blend. In 1908, the Brignole family planted the 4.2 acre block that is now our Old Vine Zinfandel. Old vineyards can be challenging to farm. Back in those days, vineyards were planted to be cultivated by horses and mules, so the vines are narrowly spaced, making it difficult to work with our modern-day tractors. Another challenge is that the vineyard is planted on a fairly steep hillside, covered with thin rocky soil, which limits annual yield to only 2 to 3 tons of grapes per acre. But what grapes they are! Fruit of top quality, with intense varietal flavors characteristic of the Alexander Valley, translates into a fantastic wine! 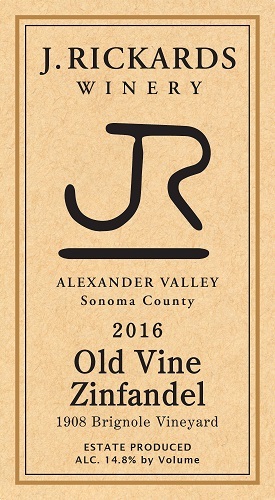 Our 2016 Old Vine Zinfandel perfectly represents this historical style of wine, with bright aromas of ripe red fruit and sweet spice. On the palate, flavors of blackcurrant, rhubarb, and baking spices lead into an extended finish of subtle vanilla.